Signals have been mixed recently for the oil and gas industry. 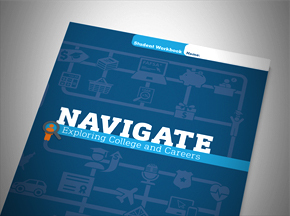 Pipeline limitations continue to take center stage, slowing production growth. Mining employment growth decelerated over the summer. Crude prices ticked up in the most recent data, but gas prices in West Texas plunged. Oil and gas inventories rose from seasonally low levels, and exports continued to grow. Texas mining employment increased by 5,800 jobs over the three months ending in August (a 10.3 percent annual growth rate). However, 4,400 of those jobs were added in June. The rest of the summer saw substantially slower growth on net. Support activities for mining added 5,000 jobs (13.5 percent) for the three months ending in August, while extraction added 800 (3.9 percent). Regionally, mining jobs in Houston grew by only 800 (3.9 percent) from May to August. The remainder of the 5,800 Texas jobs were added in the rest of the state, primarily in the field. Over the three months ending in July, oil and gas employment nationally grew by 2,800 (6 percent) (Chart 1). After a slight softening over a summer spent in the mid-to-low $70 range, the monthly average price of Brent crude ticked up during September to average $79 (Chart 2). Weaker exports from Iran in August and the first half of September lent credence to reports that international firms may be having more trouble circumventing U.S. sanctions on Iran. 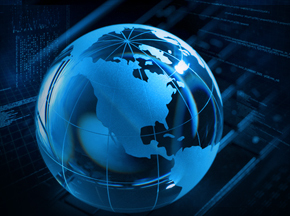 A dip in U.S. crude inventories and a slight downward revision to the U.S. production growth forecast in the Energy Information Administration (EIA) September outlook were among the other contributing factors to recent higher prices. The price of West Texas Intermediate (WTI) crude priced in Midland, Texas, ticked up along with Brent in September, rising from an average of $52 in August to $58—a $21 average discount to Brent. WTI priced in Cushing averaged $70 in September. The price of Henry Hub natural gas has been flat since last winter and stood at $2.97 per million British thermal units (MMBtu) in September. 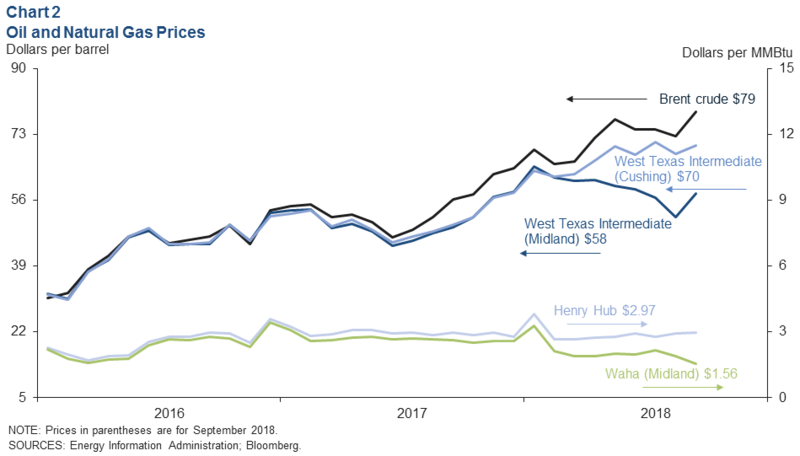 Natural gas at the West Texas Waha hub—also constrained by pipeline capacity—slipped further to average $1.56 in September. In particular, Waha prices plunged to near-record lows in the second half of the month, closing at 81 cents per MMBtu twice, with a discount to Henry Hub of over $2.20 on those days. The drop was reportedly spurred by force majeure declarations on two pipelines carrying natural gas out of the region. Much of the gas produced in the region comes as a byproduct of oil production. The U.S. rig count was flat from late June through September at nearly 1,050 active rigs. However, the number of wells drilled each month grew over the summer, according to EIA data—suggesting ongoing gains in drilling efficiency over that time (Chart 3). 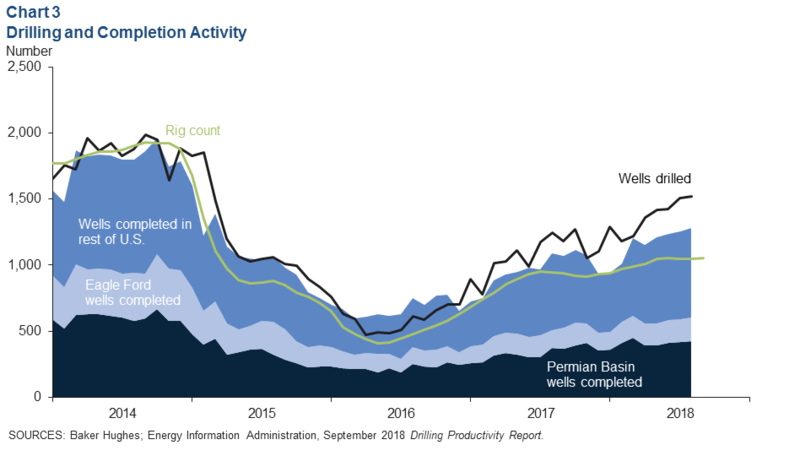 Well completions—bringing a well that’s been drilled into production—have not kept pace with drilling activity especially in the Permian. That basin accounted for 40 percent of the wells drilled over the summer, but only for a third of the wells completed. Lower wellhead prices in West Texas, driven by transportation bottlenecks, are necessitating the slower rate of completion and putting downward pressure on demand for related services such as sand and pressure pumping, according to industry reports and surveys. 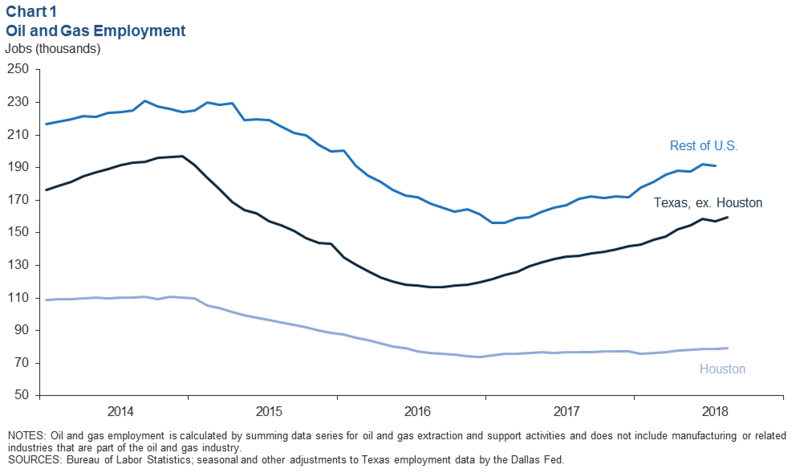 The business activity index in the third-quarter Dallas Fed Energy Survey dipped slightly in aggregate from 44.5 in the second quarter to 43.3. The decline was driven by oilfield services (OFS) firms, whose activity index fell 8.3 points to 45.9 (Chart 4). In contrast, the index for exploration and production (E&P) firms rose 4.6 points to 41.8. The dichotomy between OFS and E&P firms dovetails with recent trends in drilling and completion activity. A slightly smaller share of firms reported an increase in wages and benefits in the third quarter. 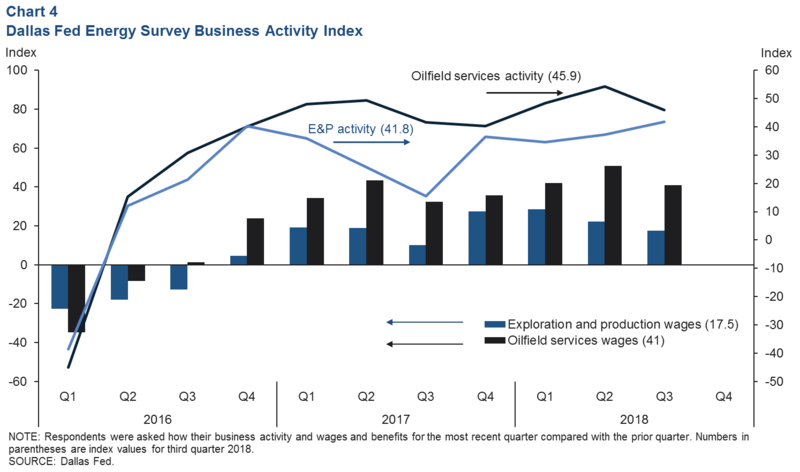 Both OFS and E&P wage indexes saw increases on net, but wage pressures remained substantially higher for OFS firms, whose scores were 23.5 points higher than those for E&P companies in the quarter. The seasonally adjusted level of working natural gas in storage hit a near four-year low in April 2018 at 1.9 trillion cubic feet (tcf)—330 million barrel-of-oil equivalents (mboe). Although natural gas stocks had recovered to 2.3 tcf (404 mboe) by August, stocks were still 516 billion cubic feet (89 mboe) below year-ago levels (Chart 5). Weekly data for September gas storage indicate that inventories may have fallen further. This is particularly true for the West South Central region, which saw an unseasonably sharp stock draw the week of Sept. 21. Heading into winter, low inventories in the South and lower-than-normal inventories in the East increase the possibility that a cold snap might lead to price spikes over the winter. Seasonally adjusted U.S. crude oil stocks excluding Cushing, Oklahoma, have been trending up since January and reached 399 million barrels in September. 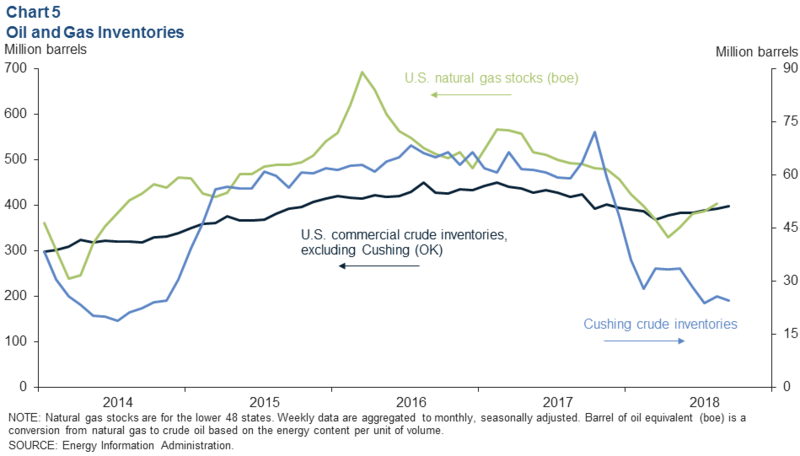 In contrast, crude stocks in Cushing have fallen over the past three months to 24.6 million barrels. Oil Vessels Exporting from the U.S.
Exports of crude oil from the U.S. have been surging over the past several years. Approximately 289 million barrels (bbls) were exported via water in the first half of 2018, up 237 percent from the first half of 2017, according to ClipperData. If the average daily export volume observed in July and August were held constant through year’s end, U.S. water-borne exports would grow another 62 percent year over year in the second half of 2018. Four major types of vessels are carrying U.S. crude to the world. 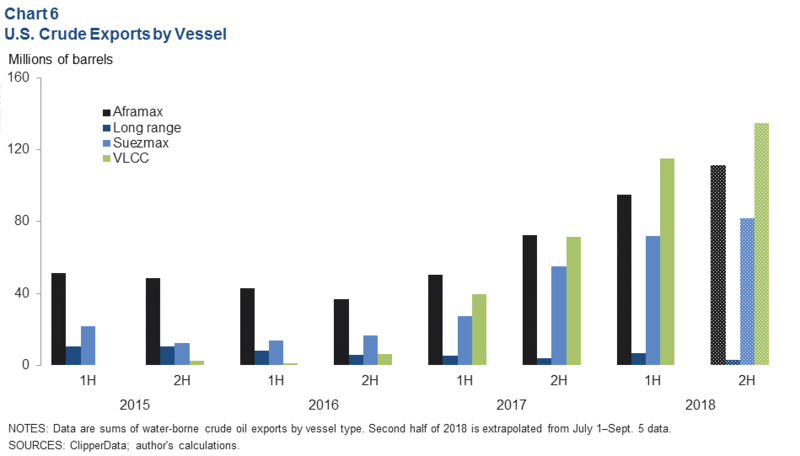 VLCCs (very large crude carriers) are massive ships that carry up to 2.5 million barrels in a single vessel and have gone from carrying virtually none of U.S. water-borne crude exports in 2015 to 40 percent of them in the first half of 2018 (Chart 6). Suezmax ships (790,000 to 1.3 million bbls of capacity) carried a quarter of U.S. crude in the first half of 2018. Aframax vessels (528,000 to 790,000 bbls), which can call at most global ports due to their smaller size, took another third. The smaller vessel, the Long Range 1 (296,000 to 528,000 bbls), carried the remainder.